Professor Fate wrote: Source of the postI'm not the one who introduced Samantha Bee into this thread. No one said you did, but instead of asking "How did Samantha Bee get into the conversation? ", you went on at length trying to equate her comment with Barr's. I was just wondering why you drew a red line at Ted Nugent...hmmm, what could it be? "Trump is what he is, a floundering, inarticulate jumble of gnawing insecurities and not-at-all compensating vanities, which is pathetic." "How stupid is our country?" You don't suppose it had to do with the fact that they both are comedians with TV shows who both made demeaning statements a day or two apart, both apologized, and each was treated differently? Nah, couldn't be that. Well, obviously we have giant butterflies in CA. They's climbin' in your windows, They's snatchin' your people up, tryin' to steal 'em. So y'all need to hide your kids, hide your stars, and hide your coaches cause they're grabin' everybody out here. Come on, Prof, who do you think you're fooling? Their respective insults are not anywhere close to being equivalent and you know it. Ted Nugent was actually a far better comparison than Bee because like Barr his insult was also racist (unless you consider calling Obama a "subhuman mongrel" no worse than calling him a ****). Still stretching, eh Omar? Sorry, the two women's respective insults WERE equivalent. Ted Nugent is irrelevant to the comparison, and you know that either one of us could come up with scads of examples of reprehensible slurs on the opposing side, also irrelevant to this discussion. But, hey you keep stretching, and BTW, congratulations on your new movie sequel Elastigirl. Professor Fate wrote: Source of the post Sorry, the two women's respective insults WERE equivalent. Professor Fate wrote: Still stretching, eh Omar? Sorry, the two women's respective insults WERE equivalent. Ted Nugent is irrelevant to the comparison, and you know that either one of us could come up with scads of examples of reprehensible slurs on the opposing side, also irrelevant to this discussion. How is Ted Nugent not an equivalent? He used the same word, and he's a man. That actually makes it worse. Trump hailed him like a hero. What about when Roseanne called Hillary a c--t in 2016? That was equivalent to what Samantha Bee did, but ABC then gave her a show. Can someone please explain this to me? When a celebrity refers to another person as a c*nt, or a tw*t, their careers continue merrily along their way. But when a celebrity refers to another person as the result of a union between the Muslim Brotherhood and Planet Of The Apes, they're done. Why is the destructive power of one reference infinitely higher than the other? C'mon MDD, that's an easy one. RB wasn't clear as the the ape species. 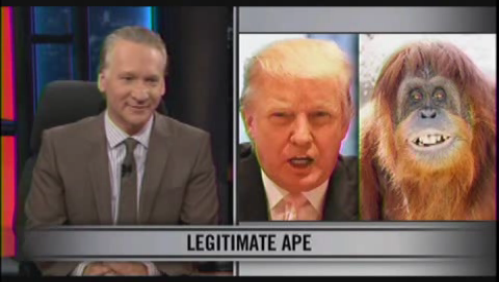 When Maher referred to Trump as an ape, he clearly showed him as an orangutan. Had she been more clear, everyone would be looking forward to her next episode. Last edited by John Q. Public on Tue Jun 05, 2018 9:39 am, edited 1 time in total. We've already been over the sordid history of people comparing people of German ancestry to orangutans. The people close to Roseanne say there's a whole lot more to the story than one tweet, unlike the others. Except maybe Nugent. Don't look at me, I just work here. MDDad wrote: Can someone please explain this to me? Sad that you don't understand why racism is worse than someone being coarse. This cartoon sums it up. They told me if I voted for Hillary Clinton the president would be emotional, impulsive, and unpredictable. They were right. I voted for Hillary Clinton and got a president that is emotional, impulsive, and unpredictable. Your cartoon doesn't include the reality that if the the people controlling the door like your politics they won't show you the door. MDDad wrote: Source of the post Can someone please explain this to me? I'd be happy to explain it to you MDDad, but afterwards you'll have to explain to me why someone who claims to have a degree in American History would ask such an ignorant question. Let me know if you want that explanation. He has the Canadian degree in American History. That might be why. No poutine. I don't know what classes MDDad took, but there's a lot to be said about studying the various ethnic and cultural histories. There's a lot of insight to be had about where we are and how we got here.